A simple mortgage calculator to help you figure out your monthly repayments and lifetime interest payments for a simple mortgage. A very simple mortgage calculator. These inputs are entered in the yellow shaded input cells in the model above. 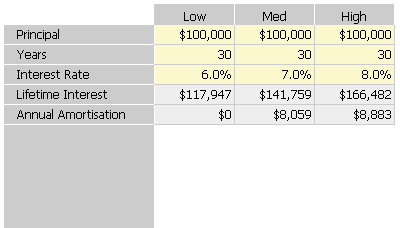 The model lets you calculate three scenarios, which are shown in separate columns of the Sumwise spreadsheet. In this embedded model, these columns are labelled Low, Med, and High, but feel free to Login to Sumwise to change these labels. Logging in will also allow you to save your scenarios and create and open other Sumwise models. Sumwise is a new type of online spreadsheet designed specifically for financial modeling. Current spreadsheet technologies (like Excel and Google Docs) are powerful and flexible, but they are also unstructured and error prone. And spreadsheets, once built, are not easy to modify or extend. Sumwise addresses all of these problems with clever features like: user defined row and column names; rows and columns that can be tagged with meaningful keywords; and cell groups that share a common formula and formatting across a range a related cells. Sumwise was invented and developed by a small dedicated team of software developers and spreadsheet experts in Sydney, Australia. If you’re interested in learning more please visit our website or send us an email. Do you have any ideas for other Really Useful Models? Please visit our support site and let us know.